Guiding passengers through Belfast’s notorious neighbourhoods and city streets, the famed Black Taxi Tours are the easiest (and safest) way to get a sense of the Troubles, from both sides of Northern Ireland’s warring divide. Drivers of the taxis are veterans of this environment, to which they owe their experience and knowledge, and passengers should expect an insightfully detailed (and friendly) tour of Belfast’s divided political and religious landscape. On the republican leg of the journey through the Falls Road, reminders of British brutality and the IRA’s unyielding resistance to it are everywhere. Once living pieces of an impossible puzzle, these are now something of an antiquated oddity. The generation to have grown-up in tandem with the Belfast of today must wonder with seeded suspicion – greater than that of any tourist – about the tribal murals painted on the walls of red-brick estate houses and apartment buildings, just as the generation to have grown-up in fear amidst constant threat from all sides must mistrust, with equal suspicion, the harbingers of peace. Due to the inequalities of life preceding and during the Troubles, the Catholic underclass in Northern Ireland have long seen their cause as similar to that of black Americans, and somewhere between murals of the martyred hunger striker Bobby Sands and other symbols of Irish nationalism is the “solidarity wall,” which depicts the right honourable abolitionist Frederick Douglass, who escaped from slavery in 1838. Separated from the Falls Road by an 18-foot-high, reinforced barrier (or “peace wall” as it’s called), the Shankill Road makes up the expansive loyalist region known for its associations with the paramilitary organizations, the Ulster Volunteer Force (UVF) and the Ulster Defence Association(UDA). The Shankill Butchers, a terrifying group of rogue paramilitaries, used to indiscriminately capture and brutally execute innocent Catholics and Protestants during the 70s. Throughout the Troubles the area suffered at the hands of the IRA, whose ruthless bombing campaign targeted bars and shops. One of the worst incidents, the shoddy 1993 bombing, resulted in the deaths of nine innocent men, women and children and fed into an ugly culture of revenge. 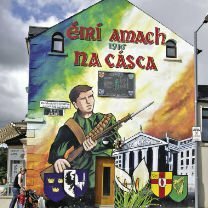 Its violent upbringing is reflected in several murals, which tend to be more fearsome and vitriolic than their Catholic counterparts.